Ever since Battlestar Galactica, my writing has become more and more structured, culminating in the first season of Da Vinci’s Demons which was, in essence, a five-hour symphony woven around a meticulously constructed musical palindrome. 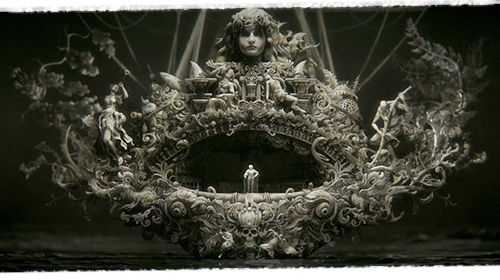 That style of classical composition would have utterly destroyed the gritty realism that the producers strove for in Black Sails. I needed to revert back to a primal creative state: my goal was to create music that sounds improvised by an exhausted crew aboard a ship navigating choppy waters. I wanted the audience to sense dirt beneath fingernails plucking jangly mandolin strings, to feel urgent strains of a hurdy gurdy crank, and to smell stale air wheezing out of old accordion bellows. To achieve this, I had to rethink my entire creative process and unlearn the results of a lifetime of classical music study. I first heard about Black Sails from showrunner Jonathan E. Steinberg, shortly after our collaboration on the comic-book adventure series Human Target. With Human Target, we had a model: the swashbuckling film scores of Goldsmith, Williams and Bernstein. This time, it was clear that Black Sails would require the polar opposite approach—raspy imperfection in place of classical thematic construction, chaos where there was once order. We threw out any notions of using a symphonic orchestra and built a new ensemble from scratch. From my earliest sketches, the sound of Black Sails would clearly be defined by two instruments: accordion and hurdy gurdy, both of which I happen to play myself! For the first time in my career, I suddenly found myself a primary soloist in my own music. The psychological effect was profound: I began composing with the hurdy gurdy instead of the piano. Never before have I written music with an instrument besides the traditional keyboard. 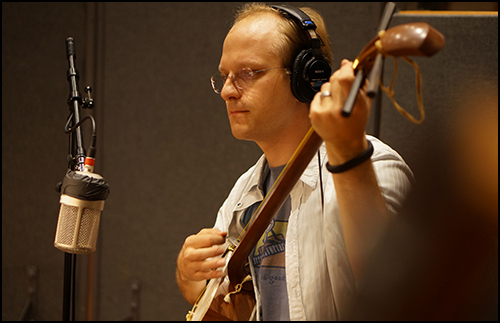 For the instrumentation of Black Sails, I focused primarily on historically accurate sounds: a string quartet, rhythm guitar trio, percussion duo and various historical solo instruments. Most of this merry band have worked with me for the better part of a decade, and they too had to unlearn our old habits. For the first time, I relaxed my ruthless pursuit of rhythmic perfection and intonation precision, and asked them not to play “too perfectly.” We had to completely redefine what it meant to play in tune. These intrepid musicians had the unenviable task of matching pitch against finicky ethnic guitars, exotic woodwinds, bagpipes, accordion and the wobbling wail of the hurdy gurdy. To facilitate this process, my co-producer Steve Kaplan and I set a limited number of takes to prevent us from overthinking our performances. We assembled musicians into small ensembles and recorded them in the studio at the same time, a practice we had traditionally avoided in the past. I encouraged the musicians to improvise and react to the others surrounding them, allowing us to find the sound in the room together. Listen to the playful interaction between the bodhrán and bones in “The Banner of Captain Flint,” or the “just loose enough” rhythmic feel between the slithery slide guitar, stealthy fiddle and chugging ethnic guitar in “Streets of Nassau.” These grooves could not have been accomplished by overdubbing soloists one at a time (believe me, we tried!). Because the series takes places in a real historical time and place, I felt strongly that both the score and source music should draw upon historically accurate melodies. I collaborated once again with music historian Adam Knight Gilbert, who had already taught me so much about Renaissance music for Da Vinci’s Demons. 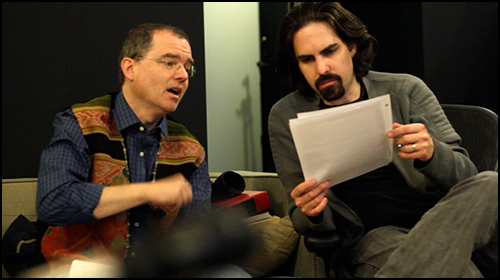 Adam brought a wealth of knowledge and material to my score. 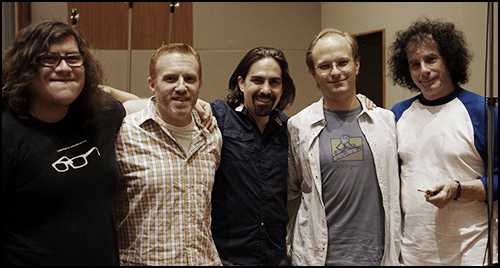 Our first recording session took place over six months before principal scoring would begin, and involved getting the band together and jamming through over a dozen traditional source tunes compiled by Gilbert. Sea shanties from the 1700s were, for the most part, not formally notated, and obviously not recorded. They have survived through oral tradition and through the liturgical music from which many were adapted. Adam pulled out religious music from the period and showed us the primary melody, often buried in the tenor line. He would then demonstrate how that line was bastardized into popular forms, swung into jigs, dances and sea shanties. These variations could be so drastic that one basic melody could spawn multiple popular songs. Listen carefully to the jaunty “Captain Kidd” and the lyrical “Wondrous Love” and you’ll realize they are both the same song! The only difference is attitude. Gilbert’s knowledge also extended into instrumental performance technique. He taught us the period-appropriate way to bow the fiddle, strum the guitars, improvise penny whistle harmonies and phrase accordion accompaniment. That afternoon was a fascinating crash course in music history for all of us, truly one of the most memorable sessions of my life, as you will see in an upcoming video blog about it. Recording these traditional source pieces set much of the tone for how I would eventually write my original score, and also yielded useful recordings that you will hear sprinkled throughout the series and the soundtrack album, including “Wondrous Love,” “All Saints” and “Captain Kidd.” I would later adapt one of these cuts, “The Parson’s Farewell,” into an epic arrangement that is one of my favorite tracks on the entire album, one that plays an important role later in the series. 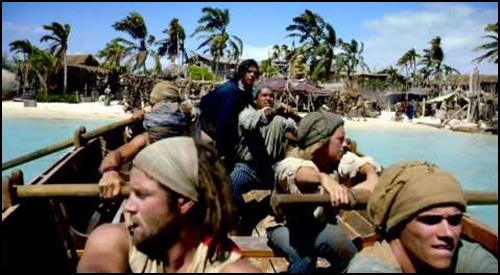 Relying on traditional source music and player improvisation does not mean that Black Sails lacks compositional structure. Though relatively limited, there is a thematic backbone that follows the progression of our characters, starting with the premiere episode. 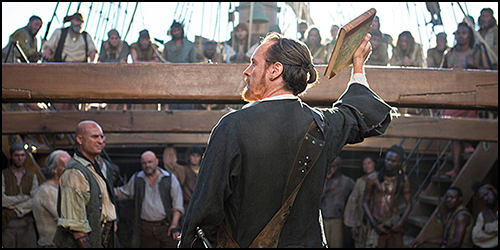 MODERATE SPOILERS AHEAD: Black Sails begins with a battle at sea, as we meet a captain trying to defend his crew from an onslaught of pirates. The producers intended for this sequence to feel as real as possible, so we all agreed that there should be no music at all. We were a bit nervous about starting the series without music, so it was decided that I would add some light percussion layers just to tie the whole thing together. I tackled this scene first, because I thought it would be easy. The idea evolved rapidly, however. Rather than using percussion instruments (which fans know I’ve done in the past), I let the rhythm trio provide the energy: scraping fiddle bows, scratched guitar strings and the muted thud of a plucked Japanese shamisen. Above that, I had the bodhrán and bones improvise wildly. In the past, I would have let the small percussion instruments be the background and put the interesting solos in the guitars and fiddles. This arrangement was the polar opposite approach and the result was striking. Suddenly, this ‘simple percussion layer’ idea was getting interesting. Very interesting. To my surprise, and to the surprise of the producers, what began as a throw-away background layer became the definitive sound of action cues for Black Sails. 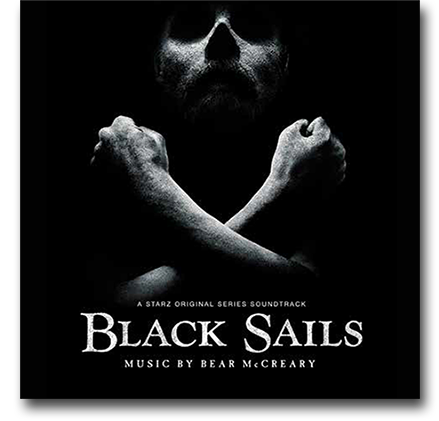 Setting out, I would never have guessed that “The Banner of Captain Flint” would have been album-worthy, and yet it has become one of the most exciting tracks on the whole soundtrack. My first Black Sails cue was born. Though this opening cue defines much of the sound of the score, it is devoid of any thematic ideas. Sure, I could have quoted a John Silver Theme when he fights the cook, and stung a big Captain Flint Theme when he reveals his face. These ideas would have been fine for a different series. 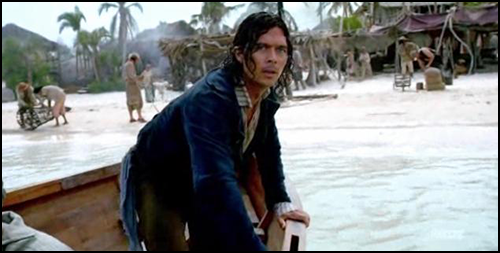 For Black Sails, it became clear I would need to be very careful where and how I introduce thematic material. This theme has a limp – it feels like a waltz, but the 7/4 meter gives it an uneven quality. Jonathan Moerschel’s solo viola introduces the main theme, before the rest of the Calder Quartet eventually picks it up. For this scene, the L’Urca De Lima Theme is like a ghost, an ethereal idea just out of grasp. As the series progresses, and our heroes get ever closing to their goal, the music associated with the ship and its treasure becomes increasingly urgent. 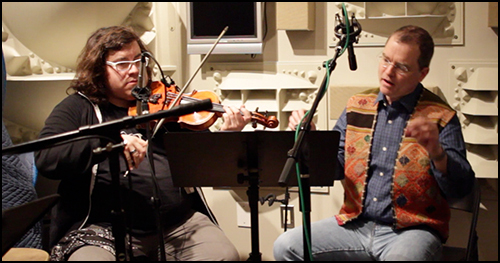 For their intimate love scene, Paul Cartwright’s solo fiddle begins the cue. He is joined later by Chris Bleth’s pennywhistle and my accordion chords. “Wondrous Love” will function as a character theme for Eleanor and Max throughout the series, undergoing darker permutations as the story progresses. I hope you catch this daring show and get lost in the gritty realism of the world. In upcoming blogs, I’ll introduce more primary themes as they work their way into the score, including themes for Flint and Vane. Future video blogs will take us behind-the-scenes to the percussion sessions, the rhythm trio, our source music session and more. 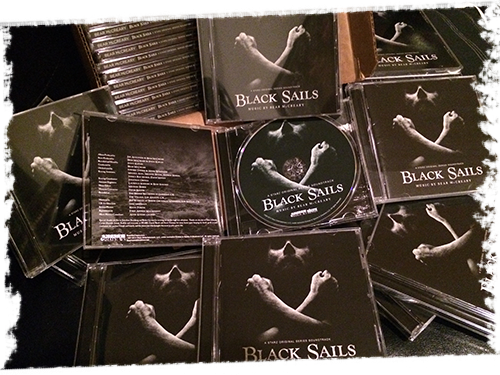 The Black Sails soundtrack album is out today, available from Sparks & Shadows. The record is available digitally, from iTunes and Amazon and is also available on CD. S&S has done a spectacular job with this one. The master sounds incredible, and the booklet is gorgeous. Today’s release is a milestone for me. Last year, I was thrilled when my label released the soundtrack to Da Vinci’s Demons as the penultimate episode aired on Starz, giving fans access to the music on the tightest turnaround I’d ever mustered for a television soundtrack. 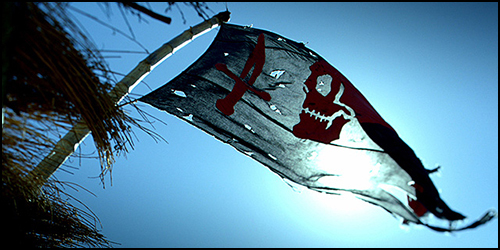 With Black Sails, we’ve upped the ante. Now, the soundtrack for the complete season is available within days of the premiere! This is rare due to the constraints of television schedules, and I’d like to thank everyone at S&S, especially Joe Augustine, for the hustle in making this happen. After spending my entire career in pursuit of the most perfectly orchestrated melody, the most elegantly voiced chorale, and the most precisely tuned solo, Black Sails allowed me to return to a primal state of creativity — to create something primitive, but no less effective. It pushed me out of my comfort zone and, honestly, changed my whole creative process. I hope you guys enjoy this music as much as I enjoyed making it. Check back here in the coming weeks for more about this unusual series.